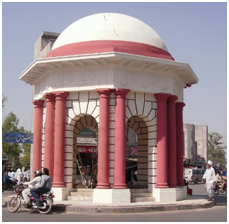 THE CITY WAS FOUNDED BY THE GREAT BRITAIN IN 1892 BY SIR CHARLES JAMES LYALL FOR WHOM IT WAS ORIGINALLY NAMED LYALLPUR. PRIOR TO THE BRITISH MAKING THE AREA INTO AN URBAN CENTER, IT LARGELY CONSISTED OF VARIOUS VILLAGES. 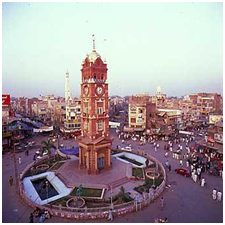 THE CITY-CENTER OF LYALLPUR (FAISALABAD) WAS DESIGNED TO MODEL THE BRITISH FLAG, WITH A LARGE CLOCK TOWER IN THE CENTER AND EIGHT BAZAARS AROUND THE CLOCK TOWER. THE CONSTRUCTION OF VARIOUS CANALS ALLOWED THE AREA TO BE IRRIGATED. AFTER THE FOUNDING OF THE CITY, PEOPLE WERE INVITED TO THE CITY WITH PROMISES OF LAND IF THEY WERE TO WORK IT. THIS ALLOWED THE CITY TO GROW RAPIDLY. FAISALABAD, (PUNJABI, URDU: فيصل آباد‎) FORMERLY KNOWN AS LYALLPUR, IS THE THIRD LARGEST METROPOLIS IN PAKISTAN, THE SECOND LARGEST IN THE PROVINCE OF PUNJAB AFTER LAHORE, AND A MAJOR INDUSTRIAL CENTER IN THE HEART OF PAKISTAN. THE CITY WAS RENAMED "FAISALABAD" IN HONOUR OF KING FAISAL OF SAUDI ARABIA. 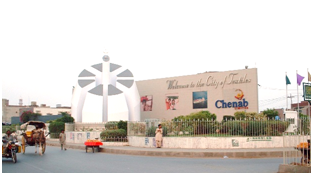 ALSO KNOWN AS THE MANCHESTER OF PAKISTAN, FAISALABAD REMAINS AN IMPORTANT INDUSTRIAL CITY WEST OF LAHORE. THE CITY-DISTRICT OF FAISALABAD IS BOUND ON THE NORTH BY THE DISTRICTS OF HAFIZABAD AND CHINIOT, ON THE EAST BY NANKANA SAHIB, ON THE SOUTH-EAST BY OKARA, ON THE SOUTH SAHIWAL & TOBA TEK SINGH, AND ON THE WEST BY JHANG. 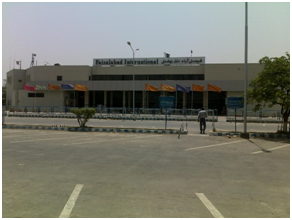 FAISALABAD INTERNATIONAL AIRPORT (IATA: LYP, ICAO: OPFA) IS SITUATED ON JHANG ROAD, 10 KILOMETERS (6.2 MI) AWAY FROM THE CITY CENTRE OF FAISALABAD, IN THE PUNJAB PROVINCE OF PAKISTAN. 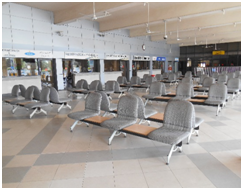 IT IS NOT AS LARGE AS THE OTHER AIRPORTS IN PAKISTAN, AS IT OPERATES TO CATER MAINLY TO THE POPULATION OF FAISALABAD, JARANWALA, JHANG, CHINIOT, GOJRA, DIJKOT, KHURRIANWALA, SANGLA HILL, TOBA TEK SINGH, RABWAH, SARGODHA, BHAWANA, CHAK JHUMRA, KHICHIAN,JAHANGIR KLAN, AND LALIAN. THE AIRPORT TRACES INTO ORIGINS NOT TOO FAR INTO THE PAST. THE FOUNDER OF THE CITY DECIDED THAT FAISALABAD HAD A STRATEGIC POSITION WITHIN THE BRITISH EMPIRE. IN 1942, THE LOCAL GOVERNMENT GAVE PERMISSION FOR THE CONSTRUCTION OF A BRICKED STRIP MEASURING 5000' BY 100'. VARIOUS REGIONAL AIRCRAFT USED THE STRIP FOR A SHORT TIME HOWEVER AS TECHNOLOGY PROGRESSED THE AIRSTRIP BECAME QUITE OUT-DATED. THE NATIONAL FLAG CARRIER, PAKISTAN INTERNATIONAL AIRLINES BEGAN DOMESTIC OPERATIONS IN 1958 OPERATING VARIOUS FLIGHTS FROM KARACHI TO EXPAND ON EXPORTS AND IMPORTS FROM THE CITY. IT WAS NOT UNTIL 1965, THE BRICKED AIRSTRIP WAS RE-BUILT TO MEET STANDARDS AT THAT TIME. THE SURFACE WAS BUILT USING BITUMEN AND THE LENGTH OF THE RUNWAY INCREASED TO 9000' BY 100' TO ALLOW THE AIRPORT TO HANDLE LARGER JET FUELLED AIRCRAFT. DURING 1966–1967 THE CONSTRUCTION OF AN AIRPORT TERMINAL AND AN APRON TO HANDLE PROP AIRCRAFT SUCH AS THE FOKKER F-27 FRIENDSHIP WAS CONSTRUCTED. IN 1972 A NEW PARALLEL RUNWAY WITH DIMENSIONS 9000 FEET BY 100 FEET WAS CONSTRUCTED WEST OF THE EXISTING RUNWAY, SINCE THE EXISTING RUNWAY HAD DETERIORATED QUITE SIGNIFICANTLY. THE NEW RUNWAY WAS DESIGNED TO HANDLE EVEN LARGER AIRCRAFT SUCH AS THE BOEING 737. IN 1974 A JET APRON, TAXIWAY-B, AIR TRAFFIC CONTROL BUILDING AND MET OFFICES WERE CONSTRUCTED. 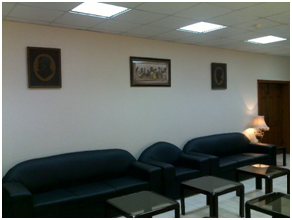 A PREMIUM LOUNGE AND ILS WERE INSTALLED IN 1985. IN 1986 THE TERMINAL BUILDING WAS EXTENDED TO ACCOMMODATE GREATER NUMBER OF PASSENGERS AND MEET FUTURE GROWTH IN AIR TRAVEL FOR THE CITY. IN 1991, THE OLD RUNWAY WAS WIDENED, STRENGTHENED AND EXTENDED REACHING DIMENSIONS OF 9270' BY 150' WITH SURFACE BITUMEN TO ACCOMMODATE AIRBUS AIRCRAFT SUCH AS AIRBUS 310S. 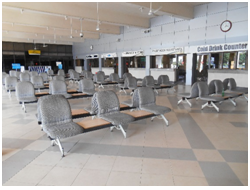 IN 1993, CIP LOUNGE WAS CONSTRUCTED AND TERMINAL BUILDING WAS EXTENDED TO ACCOMMODATE GREATER TRAVEL GROWTH. IN 1998, DIRECT HAJJ OPERATIONS WERE STARTED FROM THE AIRPORT ANNUALLY, ALLOWING MORE FLIGHTS AND TRAFFIC GROWTH FOR THE AIRPORT. 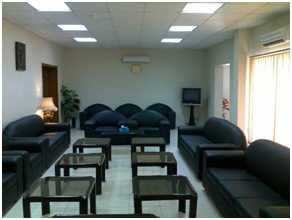 Faisalabad International Airport has a briefing & concourse Hall, Departure, Arrival, CIP & Executive Lounges are available in the Terminal building for both Domestic and International Operation. The seating capacity of each is as under. 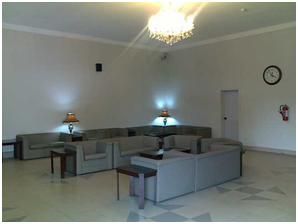 All the lounges are equipped with Air-conditioners, water coolers, Toilets for ladies and gents & separate prayer areas etc. Porter Service along with Rent-a-Car Service are available at the Airport. 325 Passenger trolleys are available in the terminal building. 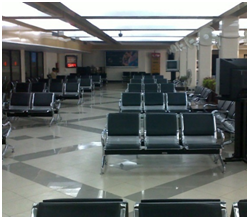 TV Network is available in the entire terminal building. Two refreshment counters, one in departure and one in concourse hall. One Canteen in the Parking Area. Car parking having a capacity of 200 Cars is available. ATM facility is available by M/S Allied Bank Limited. Bank facility is also available during Int’l Flights. 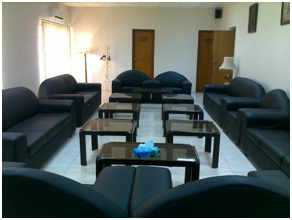 Faisalabad International Airport has the following aircraft related facilities.